Email: Use the Contact Us form or email directly. The Lucas County Children Services Ombudsman is a neutral dispute resolver. It is the Ombudsman's job to aid in the resolution of problems related to the Children Services delivery system in a non-adversarial manner. An ombudsman has the ability to investigate complaints and make recommendations, but no authority to make or reverse decisions. 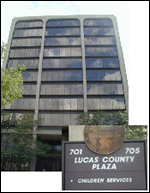 LCCS recently moved the Ombudsman function to the office of the Lucas County Family Council to ensure that the decisions being made were as impartial as possible. What can the Ombudsman do for me? The Ombudsman can investigate your complaint and determine whether you have been treated fairly. If the Ombudsman concludes your complaint is justified, (s)he will work with you and the agency to find a fair solution. If the Ombudsman concludes the complaint is not justified, (s)he will take the time to explain the reasoning. The Ombudsman is not an advocate or someone who will automatically take your side in a conflict. It is the Ombudsman's job to consider all sides of a complaint in an impartial and objective way. When should I go to the Ombudsman? Usually it is best to think of the Ombudsman as a last resort - someone who will try to help when other approaches have failed. If you have a problem, first discuss it with the Caseworker, Supervisor, and then with the Coordinator or Manager of the department involved. Many times they will explain a specific policy or correct the problem on the spot. In fact, agency staff can solve most problems quicker and easier than the Ombudsman. If you don't know who to see, or what procedure to use, by all means contact the Ombudsman. The Ombudsman can point you to the right person and explain the best way to go about solving your problem. If you have already made a reasonable effort with the agency to resolve your problem and have still not been successful, contact the Ombudsman. How do I contact the Ombudsman?